Last Pete book for my list, I promise! 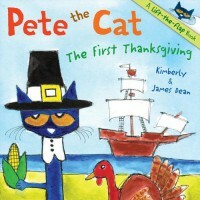 I really like this Thanksgiving book as a way to introduce the First Thanksgiving to the younger grades, with Pete telling the story it might get the kids more interested before you go into further detail about the first Thanksgiving. It's not a very detailed story so I would only use it as an interest builder when first introducing Thanksgiving.